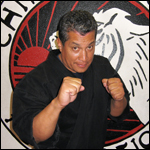 The Head Instructor of the school is affectionately known as “Sweet” Pete around the Tournament Circuit and the Martial Arts community. He is one of the most successful Karate fighters in all of San Diego’s history, being ranked in the Top 10 in the nation since 1995. He was promoted to Black Belt 1st through 4th Degree by “Chicken” Gabriel, 5th and 6th Degree Sifu by Chief Al Tejero and finally 7th Degree Siigung, 8th and 9th Degree Professor by Grandmaster “Blue” Generalao. Siheng Virgil started training in 1993 at Sweet Pete's Martial Arts Academy, Virgil is known for his creativity with techniques and attention to detail as an instructor. He also teaches the Cardio Kickbox Class where many have enjoyed his energy and his ability to motivate the class. Siheng Alex studied the the art of Kenpo for 15 years and has been teaching it since 1999. He holds a second degree black belt under Professor Pete Salas and a first degree black belt under Grandmaster Julian "Blue" Generalao. Siheng Alex currently teaches at Sweet Pete's Martial Arts Academy and has taught Kenpo in programs such as Southwestern College's "College For Kids" program, High Tech High Chula Vista's after school program, at Southwest Christian School, and now at the Center for the Arts. In addition to teaching martial arts, Alex is also an avid member of Sweet Pete's National Karate Tournament Team and competes in the sparring division at open martial arts tournaments. He was also ranked 2nd in sparring in the Western Pacific region of the National Blackbelt League. Siheng Quito has been a practitioner of martial arts since 1970. He studied Kenpo, Boxing, Tae Kwon Do & Filipino martial arts. He received his second degree black belt in 2010 under Professor Pete Salas. Quito has been teaching since 2007 and especially enjoys teaching children's classes. Sibak Leilani was exposed to martial arts at the age of 5 under the tutelage of her uncle, a black belt and avid boxer. She went on to take Judo in college and after graduation her passion for martial arts brought her to Sweet Pete's Martial Arts Academy where she has been training for over 20 years. One of the most dedicated and successful female role models in the school, she is passionate about martial arts and enjoys teaching others how to become empowered both mentally and physically. She is the top female competitor in "Sweet" Pete's National Karate Tournament Team and has won multiple Grand Championships in both sparring and forms.